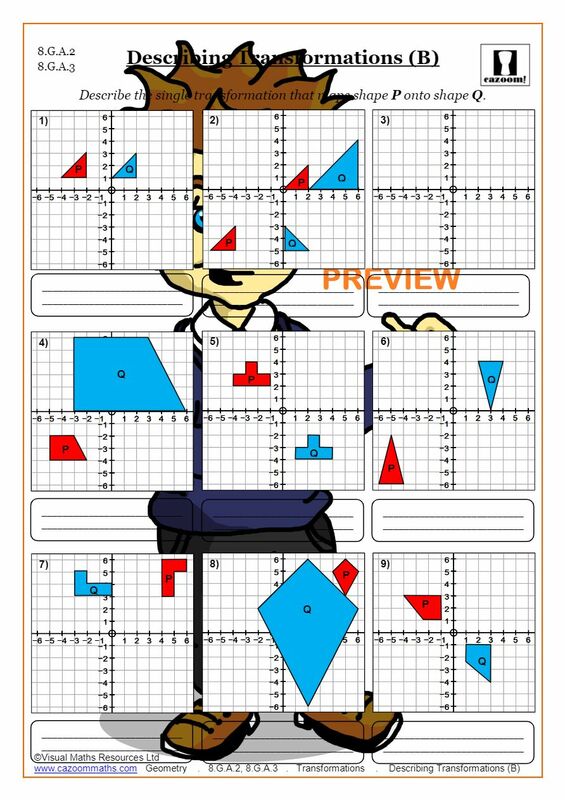 Our math transformation worksheets in PDF are designed to help students in middle school and high school master the art of translating, reflecting, rotating, and dilating shapes. Use our reflection worksheets, rotation worksheets, translation worksheets, and dilation worksheets to help your child or student understand all types of transformations. Our PDF worksheets will ensure that students are confident with all types of transformations, including reflections in the x- and y-axis, rotating figures about a given point, translating figures, describing transformations in the coordinate plane, and more. Our transformations worksheets with answers allow you to see how well your students are doing and identify areas for review. After using Cazoom, their hard work will be reflected in their grades! Geometry is everywhere, and we begin learning about it as young children. Kids love to look at patterns, shapes and designs. Many children’s toys often incorporate different forms of geometry. Why then, is geometry one of the subjects that students often struggle with the most? One of the most likely reasons is that this branch of math requires students to use their spatial skills more than their analytical skills. Geometry is really a branch based in creativity rather than analysis, and some students have not developed those skills as much. With algebra, there is a set formula and method to solve every problem, but in geometry there has to be some spatial awareness and knowledge built up to be able to use formulas to solve problems. Many geometric concepts also involve being able to visualize certain aspects of a problem. This is the case with transformations. Translations, reflections, dilations and rotations all involve some visualization of the problem to be able to figure out the answer. The good news is students (and parents) don’t have to struggle through the various types of transformations anymore. 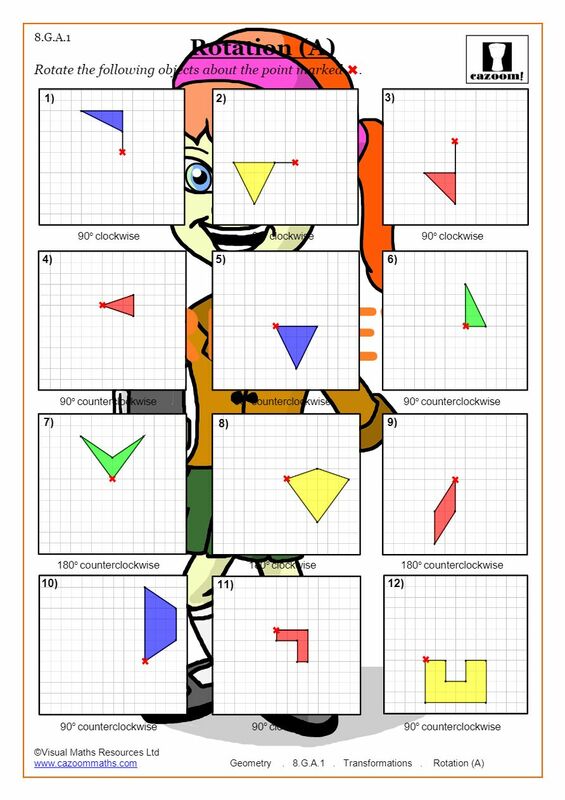 The transformations worksheets that are available through cazoommaths.com can help to bring these more abstract math concepts into focus. The available worksheets start with the basic concept and then build to more complex questions. Color examples and graphics come with each worksheet, and this helps to keep students engaged as they complete their work. For parents, there are answer keys provided for each worksheet. This makes checking work and helping students more effective. For a small monthly fee, students and parents can have access to a huge database of worksheets that can serve as the foundation for a math intervention or enrichment program to help students raise their mathematical achievement levels and experience more success at school. 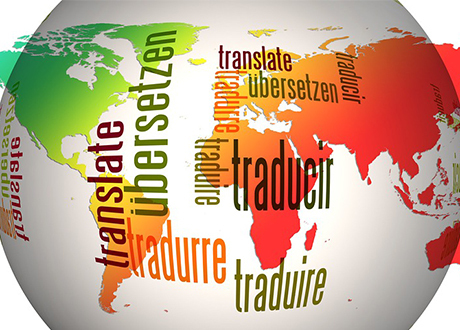 Translations are essentially moving a point, segment, line or shape to a different position without changing it in any way. 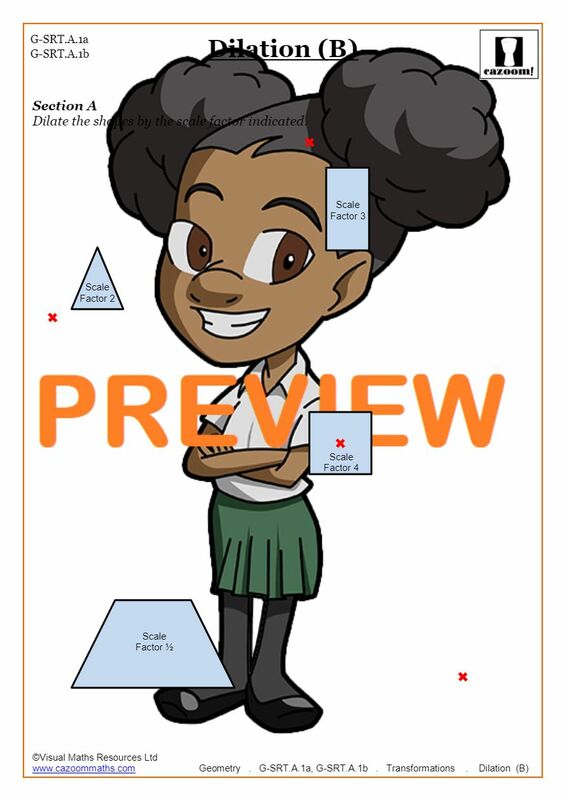 Translations take place on the coordinate grid, so it is vital that students understand how the grid works before trying to tackle the subject of translations. The coordinate grid is broken into four quadrants. Each quadrant has a set of points that help to identify specific spots on the grid. The x and y axis run vertically and horizontally within the grid forming the foundation for how points are located and named. Once students understand how to locate and name points on the grid, translations will be easier to understand. The best place to start with translations is to work with points. A point can be named with a given coordinate pair, and students can be given directions on how to translate it. For example, they could be told to translate the named point (-4, 6). This would mean students would take the original point and move it four spots to the left and six spots up. A new point would be placed in this location, and the translation would be complete. 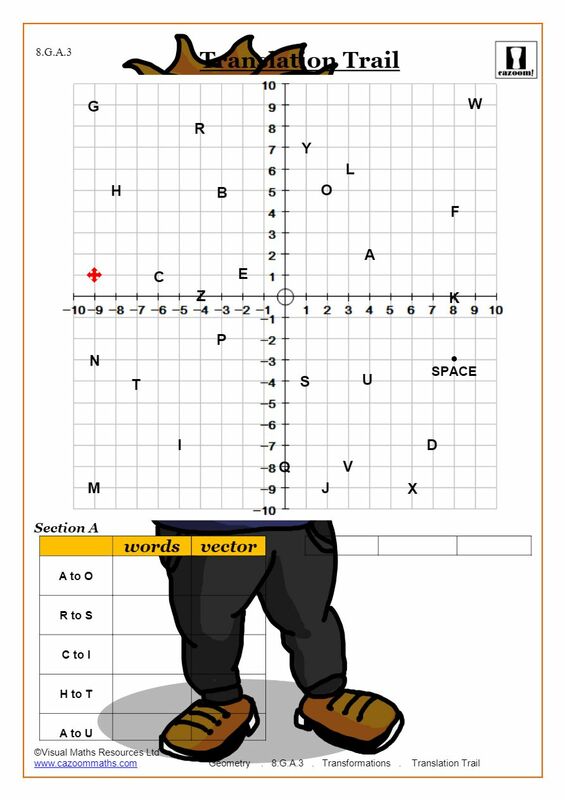 This type of work can be done with one of the many transformation worksheets that are available on cazoommaths.com. Once students can translate a point, then it is time to move on to line segments. Line segments are named by two endpoints that would again fall within the coordinate grid. Students could then be given directions to move the line segment under the translation (7, -3). Students would have to take each endpoint of the original line segment and move it seven spots to the right and three spots down. The two new endpoints would be connected, and the new line segment would be formed. This is another skill that can be practiced with worksheets to reinforce the concept, and be able to see where students are still making mistakes. Using a transformations worksheet is good practice because it allows students to go through the repetitive process of solving a certain type of math problem. Many math concepts are learned through this process of seeing an example or two, practicing several times independently, checking the work, and then fixing any mistakes that were made. Completing worksheets is also a task that parents can help with, especially when the answer key is given like it is on cazoommaths.com. The final step in mastering translations is to do the work with polygons. Any quadrilateral can be drawn on the coordinate grid using four points and line segments connecting those points. A translation of the entire polygon is simply a translation of points and line segments. Once students have mastered points and line segments, then polygons should be very understandable. Math concepts are always easier when the basic building blocks are understood, and using a transformation worksheet from cazoommaths.com is one of the easiest and most affordable ways to get a lot of quality practice in with students. Reflections in math are the same as what they are in real life. When we look in the mirror and see the reflection, we see a version of the original image that has been flipped. In maths, this flip happens over a line of reflection located on the coordinate grid. When a shape is drawn on the coordinate grid by naming three or more endpoints, that shape can be reflected by declaring a line of reflection. The line of reflection is often the x or y axis, but that doesn’t always have to be the case. To make a new shape, all the pairs of points that name the endpoints of the shape need to be moved to the exact opposite side of the line of reflection. For students who struggling with this concept, it is best again to start with reflecting a single point across a line of reflection. An example of this work would go something like this: The line of reflection is named as x = 3. This means a vertical line is drawn three spots to the right of the y axis. The next step is name a point like (5, -2). Finally, the directions could be given to draw the reflection over the line at x = 3. Since the original point is two spots to the right of the line of reflection, the reflected point would be two spots to the left. 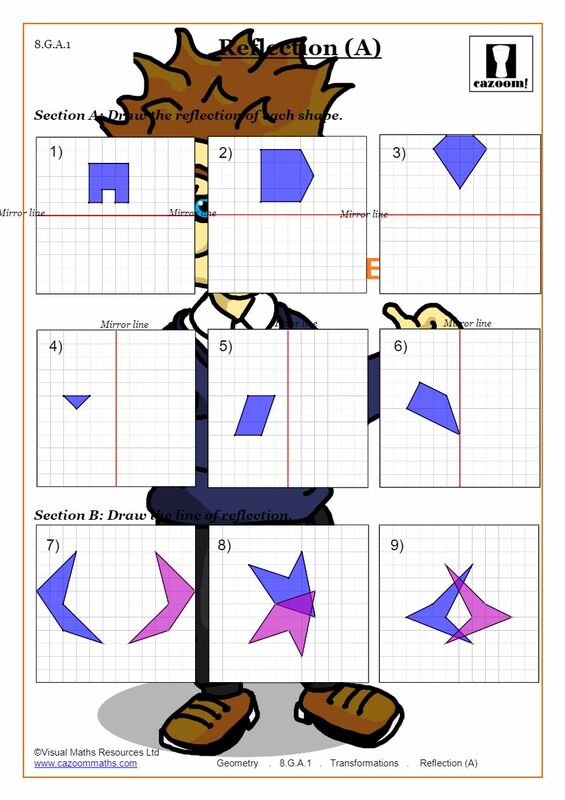 Using a geometry transformation worksheet from cazoommaths.com is a great way to practice this skill and start to learn the basics on how to figure out reflections. Once students can reflect points over a vertical or horizontal line, the next step is to work on reflecting over a diagonal line. The work with this skill is the same, but instead of moving points up, down, left or right, the points are going to move in a perpendicular direction from the diagonal line. If students remember to reflect the point in a direction that is perpendicular to the line of reflection, this concept should become easier to understand. 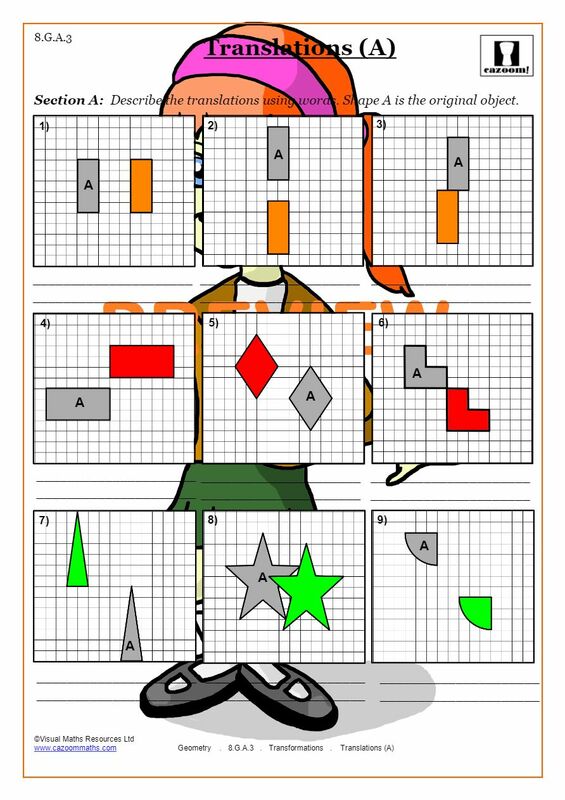 The transformations worksheets that cazoommaths.com have put together to practice the skill of reflecting points and shapes will help students move these skills from an area of struggle to an area of mastery. The final step in working through reflections with students is to reflect an entire polygon over any type of line within the coordinate grid. 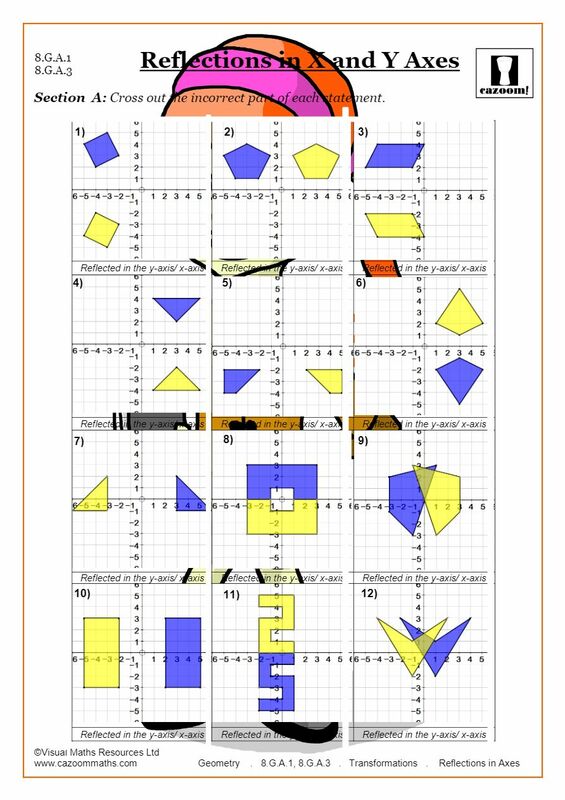 When students start to do the worksheets on transformations, they are going to quickly see that reflecting an entire polygon is simply a matter of moving each endpoint over the line of reflection and then connecting the dots to form the reflected figure. It sounds like a simple process, but this step can be a bit overwhelming and confusing because it is difficult to visualize what the reflected shape should look like. Rather than trying to visualize the entire shape, students will be better served if they simply move one endpoint at a time and then connect everything at the end. Having a solid grasp of reflections can help students in a variety of ways as they move through their school years and into a career. The use of mirrors completely revolutionized how telescopes and microscopes are used. The use of reflections has also been a major influence in artwork and design concepts that people across the world have made a part of their lives. At cazoommaths.com the goal is to help students master basic math concepts so they can apply those concepts in their day to day lives. Having a solid grasp of basic math concepts will help students have more success in school and in their careers. Another useful skill that can be practiced and mastered using the cazoommaths.com transformation worksheets is creating dilations. A dilation is a transformation that changes the size of the figure, but the shape remains the same. One of the best real-world connections to this skill is how a movie theater is able to project such a large image from such a small device. When a projector in a theater takes the small image of the movie and enlarges it to match the size of the big screen, that is a dilation. Dilations can be made on the coordinate grid like the other transformations, but they can also be made without the coordinate grid. Two things are needed in order to create any type of dilation: a center point and a scale factor. The center point is a fixed point from which the dilation is going to be made. The scale factor is what will tell students if the dilation is going to be an enlargement (scale factor greater than 1) or a reduction (scale factor less than one). In addition to a movie theater, there are several other great examples of how dilations are used in the real world. When students practice with a dilation transformation worksheet, it can be more motivating to complete the work if they can see how to apply the knowledge to a real-life situation. Photography is a great example of how dilations are put to good use. One image can be turned into prints with a wide variety of sizes. Product logos are another great example of how understanding the concept of dilations can be put to good use. When a logo is created, it is typically used on a variety of products, and different sizes of the same logo will be necessary. The work that can be done through cazoommaths.com will help students prepare for success beyond school. It is common for dilations within the coordinate plane to use the origin (0,0) as the center point. Endpoints are then placed around the center point to create a polygon. That polygon is then given a scale factor and the dilation can be created. If the scale factor is 2, for example, then each of the coordinate pairs naming an endpoint would be doubled or multiplied by two. If the scale factor was ½, then every coordinate paid would be multiplied by ½. If polygons are not on the coordinate grid, a dilation can still be made by measuring the length of each side of the original shape. The center point needs to be fixed so it is usually one of the vertices of the original shape. The length of each side can be multiplied by the scale factor to create the dilation. 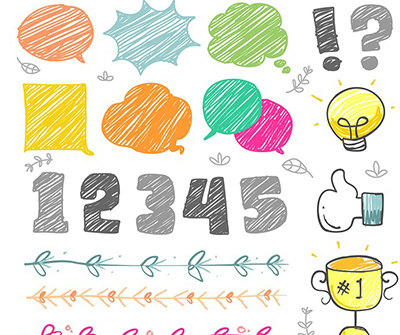 A recent study from the University of California, Irvine showed that a more traditional approach to teaching and practicing mathematics can have a more positive impact on student achievement. The more traditional approach would include using worksheets to practice skills like transformations. The team at cazoommaths.com knows and understands the value of a practice and study routine that includes the use of worksheets. 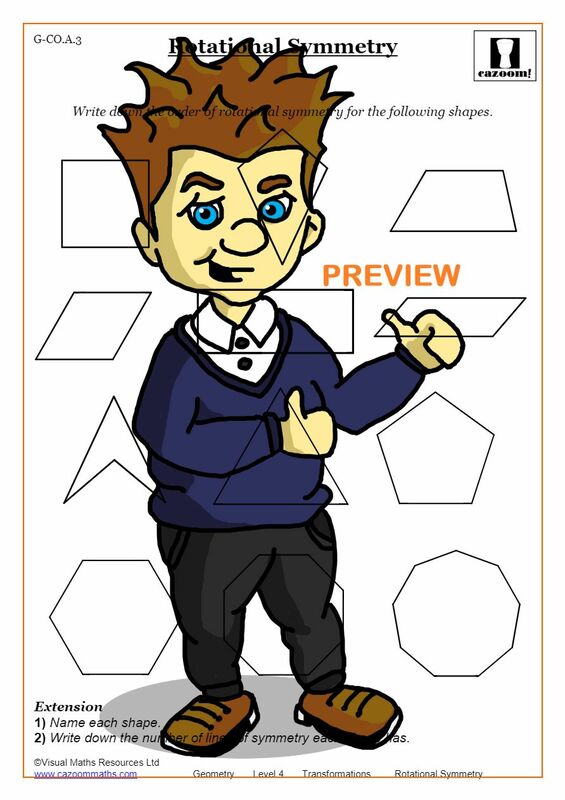 The Cazoom Maths worksheets that are available on the site are highly engaging for students. The worksheets have also been organized in such a way that allow students to practice the various transformation skills in a progressive fashion, working from simpler problems to those that are more complex. This repetitive, yet increasingly difficult practice is what will help students retain the information for a longer period, and that will help them score higher on unit tests and achievement tests. This high level of practice will also help to prepare students better for life beyond the classroom. Rotations are the fourth main type of transformation that students will need to master in their middle and high school years. Rotations work by having the polygon that has been created within the coordinate grid rotate a certain number of degrees around a given point. The rotations can either turn clockwise or counterclockwise depending on the directions that are given. When a polygon is rotated, the new figure is called the image, and the image is always going to be congruent to the original figure. 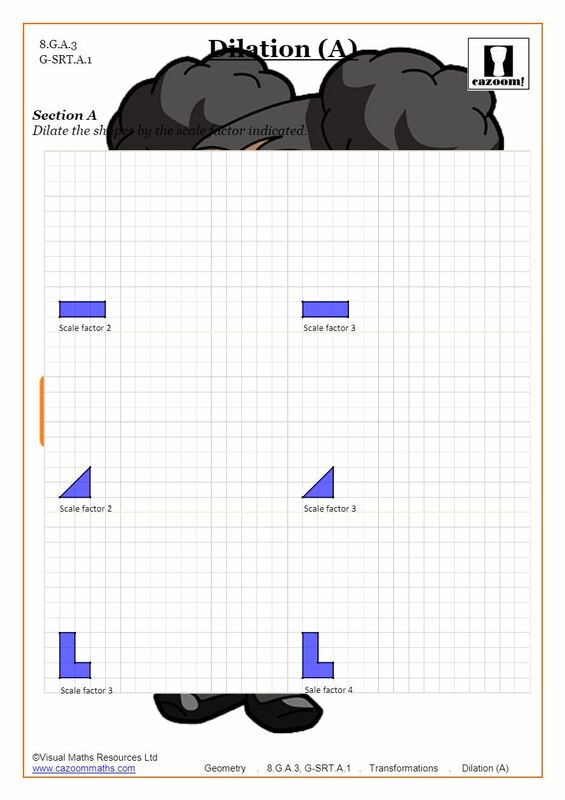 When students are practicing this skill with one of the transformation worksheets available at cazoommaths.com, they will notice that the rotations are typically a common angle like 45 degrees, 90 degrees or 180 degrees. While rotations can happen at any angle, they usually follow this pattern. When the number of degrees to rotate is positive, then the rotation will be counterclockwise. If the number of degrees is negative, then students will perform a clockwise rotation. 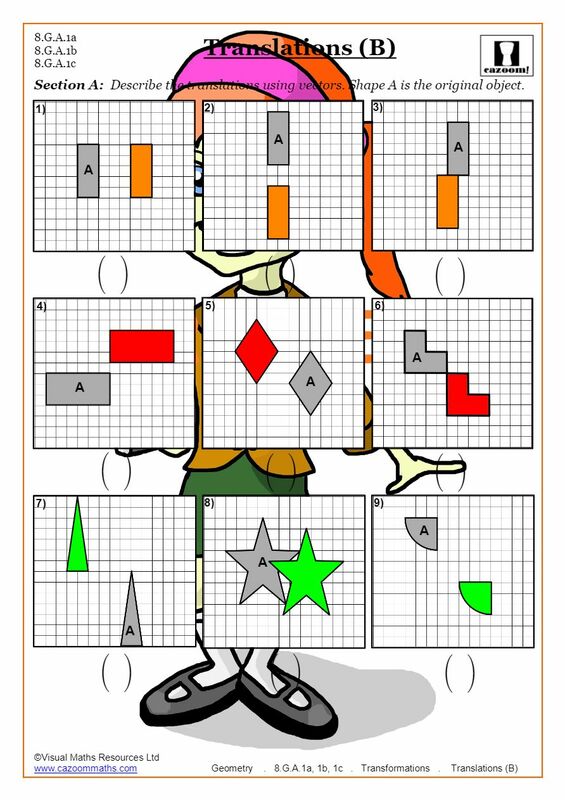 Using the Cazoom Maths worksheets to practice rotations is a great way for students to build confidence in their work. Learning rotations is a challenging process because it requires a lot of visualization of what the image should look like. Rotating figures both clockwise and counterclockwise also adds to the challenge. When students can break down the process by rotating points and then rotating entire figures, it can start to make more sense. Practicing this skill using worksheets is an effective method because the feedback loop for students is immediate. With Cazoom Maths, the answer keys are provided so students can check their work right away to see their progress. The large variety of worksheets also allows for a great deal of practice on any given skill. This means that students will not run out of worksheets even if they struggle with the skill. Making real-world connections to the skill of understanding rotations should be an easy one for most students. There are a wide variety of everyday items that rely on some sort of rotation. A blender has a blade that rotates, and that rotation needs to be uniform and operate at a certain speed. Understanding how to rotate a figure around a fixed point could help in designing the next great kitchen appliance. Another example of a real-world connection is any type of crank arm that would make gears or some other device move. This type of rotation again depends upon a uniform movement each time the arm is turned, and on everything else connected to that arm operating smoothly. Students can look at a bicycle or a clock to visualize what this looks like. Most rotations in real life must have what is called rotational symmetry. This means that no matter how I rotate a figure, it always looks the same. When students master the skill of rotations, they will be able to design and create figures that will have rotational symmetry. This can lead to a whole new skill or hobby of creating gadgets and devices that could help people in their day to day lives. Geometry is a challenging branch of mathematics that students will have to attempt to master in middle and high school. The work within the field of geometry is bit more visual, creative and requires students to use their spatial thinking more. One of the most effective ways to practice the skills that are being learned is to use transformations worksheets from Cazoom Maths. The worksheets are visually appealing to engage students in the work. For a small monthly fee, the worksheets also come with answer keys so that students and parents can check the work as soon as it is completed. Having a timely feedback loop is important when trying to master concepts in maths. Transformations are a branch of geometry that involve learning about translations, reflections, dilations and rotations. All of these skills have applications in the real world that students can connect to. Making these real-world connections make the skills much more relevant, and that is a huge factor in motivating students to learn the skills. Any student can master the various transformations if they have the proper instruction, practice, feedback, and motivation. Using Cazoom Maths as part of that process is a great way to help students increase their achievement levels and soar to success.